In an earlier article, we looked back at the 75th anniversary edition Moto Guzzi California motorcycle. 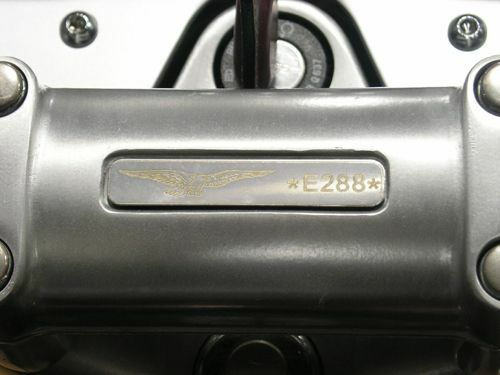 An even more exclusive limited edition California EV was produced for the 2002 model year to celebrate Moto Guzzi’s 80th anniversary, the EV 80. These bikes sold for around $13,990 US, which was about $3,000 more than a Special Sport and a whopping $2,000 more than a standard EV at the time. The seat, the removable panniers, the grip covers and the ignition key for the 80th anniversary Moto Guzzi California EV were done in a very bold red leather, which certainly was not your ordinary biker-style leather. The leather on this Moto Guzzi California EV was produced by the high-end Italian leather goods manufacturer, Poltrona Frau. This is really what made this special edition Moto Guzzi stand out from just about any motorcycle on the road. As with the 75th anniversary California, this one also has a special serial number plaque mounted on the handle bar clamp indicating the rareness of it. Some get confused by the EV 80 name. The “80” stands for 80th anniversary. 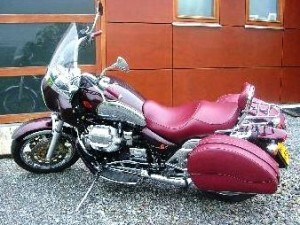 The engine in this motorcycle is the standard Moto Guzzi California 1064cc (V11) engine. At the time of writing this, there is a EV 80 Moto Guzzi for sale with only 3200 miles on it, with an asking price of for 5995 GBP (about $9000 USD or 6700 EUR) at Moto Strada in Shipley, near Leeds in the UK. Some of Emore Leather Company’s motorcycle items have even been featured on custom bikes in Biker and Easy Riders magazines. 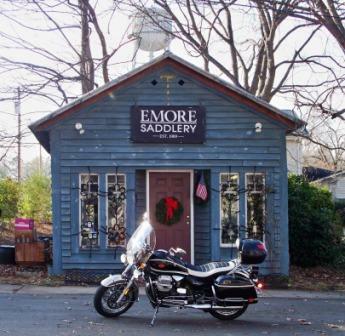 Who’d ever known that inside this little old-time building this couple has been producing some of the finest custom motorcycle leather accessories imaginable? je vends 3 sacoches poltrona frau prix a négocier. 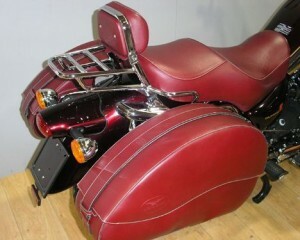 I am selling a Guzzi 80th California. Avez-vous toujours votre guzzi poltrona frau à vendre ? Pouvez-vous m’envoyer plus de photos ? a quelle adresse puis- je venir la voir ?